Here's the latest "official" Banana Republic flyer approved and distributed by HHA maintenance men in its building locations. 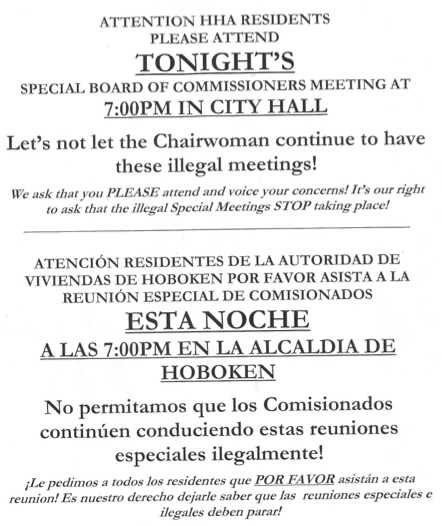 Apparently, Carmelo Garcia is resting his hopes to confuse residents the special meeting called for tonight is "illegal." Unfortunately, the meeting was noticed properly to the media (although the HHA office is following strict orders not to cooperate with the HHA Chair, among other professionals probing into the agency.) How's that working out for you Carmelo? Hey, this is an improvement over the previous lies the last special meeting put HHA residents homes at risk. That was cleared up by the chair at the beginning of the meeting. Hey, can you defame and lie about the HHA Chair using taxpayer funds?